Mike Brown told EarthSky that it wasn’t his goal to kill Pluto. The Caltech astronomer has discovered hundreds of objects in the outer limits of our solar system, but it was his discovery of the dwarf planet Eris that caused International Astronomical Union to demote Pluto from a planet to a dwarf planet in 2006. Brown is the author of How I Killed Pluto and Why It Had It Coming. He spoke with EarthSky’s Jorge Salazar. Pluto was demoted from planet status in 2006, but still, year after year, voices clamor to reinstate Pluto. That fact that it keeps coming up year after year after year is because there will always be people who have, whatever the reason, an interest in reinstating Pluto as a planet. And you’ll always hear from them, because it’s always an interesting story when somebody jumps up an down and says Pluto should be a planet again. It’s a less interesting story to say, yep, this year we still think Pluto is not a planet. But from what I can tell, from talking to astronomers and going to conferences with astronomers who study the outer solar system, like I do, there are very few people in the astronomical community who think that there’s any reason whatsoever to revisit what planets are. The solar system consists of eight very large dominant things that define it. They’re the architecture of the solar system, these eight dominant objects — the planets — that are surrounded by little bits of debris that are going in and out of their orbits. What led to the demotion of Pluto was the realization that Pluto is not this unique object in the solar system, in the way that the eight planets are. It’s really part of this whole field of debris. You see these images of the solar system where there are nine planets that are more or less the same size. You see Jupiter as a little bit bigger than the Earth, and the Earth a little bit bigger than Mercury, and Mercury and Pluto about the same size. That view of the solar system is thoroughly incorrect. It’s just not the way the solar system really looks. If the solar system really did look that way, even I would think that demoting Pluto didn’t make sense. The real deal of the solar system is that Jupiter is huge compared to anything else out there. The Earth is much, much smaller than Jupiter. And Pluto is even tinier still. It’s half the size of our own moon. Getting people to see that correct impression of the solar system, the real solar system instead of the cartoon solar system, I think is an incredibly important part of astronomers trying to educate the public. So I think not only did Pluto have it coming in the sense that it never was a big and important part of the solar system, but it actually matters a lot that we explain this to the public, that we educate people on what their universe is actually like. The media in 2005 initially heralded your discovery of Eris as the tenth planet. Given the fame of discovering a new planet around our sun, were you ever tempted to be on the side of ten planets versus eight? When we first discovered Eris and knew that we had something of the size of Pluto or perhaps larger, my first response was, of course it’s a planet — because Pluto’s a planet and anything bigger is clearly a planet too. It never occurred to me that astronomers would have the courage — I think courage is the right word — to demote Pluto. Because astronomers, like everybody else, have this nostalgic feeling about Pluto. I tried to think about this, and I finally came to the right conclusion. But at first I thought, okay, it doesn’t matter. 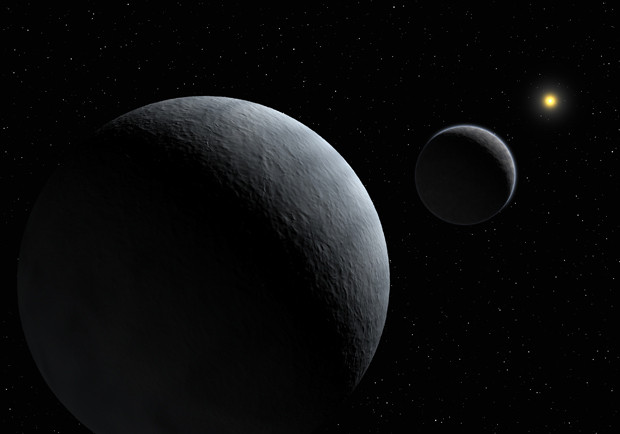 If Pluto is going to be a planet, Eris can be a planet. There can be ten planets, and we don’t really need a scientific definition of the word planet. To have Pluto and Eris be called planets, you just have to give up on science and say, well we called them planets because a planet doesn’t really mean anything and that’s what we want them to be. It’s kind of like the word “continent.” The word continent doesn’t actually mean anything. Continents are the things we say we are. And planets could be the same way. It would mean that I got to discover the tenth planet. But that would mean that there was no good scientific definition for the word planet. And that didn’t seem so good. In the end, when astronomers started grumbling about some of the proposed definitions and finally got together and considered kicking Pluto out — or actually kicking the one I had discovered out and Pluto along with it — it became clear that astronomers really were going to try get together and actually have the determination to do this, I was thrilled. Even though I lost Eris as the tenth planet, I suddenly realized that I had an opportunity to actually make a scientific definition of the word ‘planet’ that described the solar system correctly. And it’s such a beautiful thing. The solar system is arranged in such a beautiful way with these eight dominant things, and everything else flitting around between them, that if we can have our cultural view of what the solar system is mesh with the scientific view, I would gladly trade my discovery of the tenth planet for really furthering the overall world’s understanding of how the solar system is. I’m very happy with the way it worked out. The big survey we did that led to the discovery of Eris and many of these other objects all came from a telescope, the Palomar Observatory outside of San Diego. From the Palomar Observatory you can only see the northern parts of the sky. You can’t see the southern parts of the sky. So it’s taken us a couple of years to get there, but we’re now finally surveying what might be in the southern parts of the skies, and we don’t know what there is to find down there. The other project that I’m most excited about these days came from another discovery that was in our big survey, which was the discovery of the object called Sedna. Sedna is the object that we found that goes the furthest away from the sun. It has this incredibly looping, 12,000 year obit around the sun. We’ve only found one object like it, but we know that there must be many more out there, if we can just find them. The problem is that they have such looping orbits and they’re so far away that they’re incredibly difficult to find. We’ve been trying, with some of the biggest telescopes on the Earth to try to find these. The reason we want to find them is because these objects that are so far away are essentially little frozen relics of the earliest times of the solar system. They’re frozen relics in the sense that their chemistry but also in the sense of their orbits around the sun. So if we can find more of these relics, we would have these fossils from the birth of the sun, we can try to actually read this fossil record. So that’s another of these very exciting projects that we’re working on these days. What’s the most important thing you want people today to know about Pluto? I’d say the most important thing to know about Pluto is that in the scale of the solar system, it is insignificant debris. And I say that fondly. The eight planets dominate everything that goes on. Pluto and all the other things like Pluto are simply dominated by these eight planets. They’re kicked around. They’re on these crazy elliptical orbits, and tilted obits, whereas the planets are on these nice, stately orderly orbits on the inside. Pluto is not this special planetary-class object out past Neptune. Pluto is just one of many, many things like it. In the grand scale of the solar system, it’s just a little speck of debris.